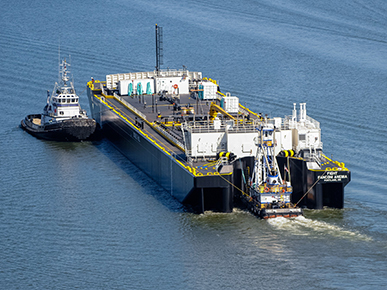 As one of the leading marine transportation service providers in the U.S., Harley Marine’s excellent customer service and powerful barges are key in moving petroleum from port to port on the East and West Coasts. Moving cargo from ports all along both U.S. coasts is no small task. It requires constant vigilance, maximum uptime and a focus on environmental sustainability. To help achieve those goals, Harley Marine Services has partnered with Pacific Power Group for their on-board cargo pump engines for five of their barges built over the last several years. With the barges reaching lengths of more than 430 feet with carrying capacities up to 82,000 barrels, managing the power supply for the cargo pumps while ensuring the highest levels of safety and meeting environmental concerns are critical to Harley Marine. Harley trusts PPG to provide Volvo Penta engines that offer uncompromising reliability on board their barges and safety features that reduce fire hazards. Over the years, PPG has provided and engineered Volvo Penta D13 engines for Harley barges built by trusted boat builders such as Vigor Industrial, Zidell Marine, and Gunderson Marine. The engines’ low fuel consumption and emissions help lower operating costs and reduce environmental impacts. Ensuring standardized, reliable cargo pump engines with impeccable reliability are powering the cargo pumps in Harley’s tank barge fleet helps reduce their lifecycle costs. Along with the Volvo Penta engines for Harley’s cargo pumps, Pacific Power Group’s support throughout the building process ensures that their power system is properly integrated before launch. With PPG as a partner, Harley Marine continues to deliver vital cargo from port to port along the West Coast. Pacific Power Group is finding more ways to help customers reduce their fuel consumption, decrease operational costs and lower their environmental impact using new Volvo Penta marine engines. Recently Pacific’s marine division supplied fuel-efficient and environmentally friendly marine auxiliary engines for two new petroleum barges currently under construction at Vigor Industrial in Portland, OR for Seattle-based Harley Marine. The articulated tug barges are designed by Elliott Bay Design and will be 422 ft. long with 83,000 barrel capacity, which will make them among the largest vessels in the Harley fleet. These new double-hull vessels will have two 400 horsepower Volvo Penta D13 MH marine engines packaged into cargo pump power units engineered and sold by Pacific Power Group. The D13 MH is a powerful EPA Tier 3 engine typically used for medium and heavy-duty marine commercial applications that offers reduced fuel consumption. In addition, PPG has supplied three radiator-cooled D13 MG diesel generator sets and custom engineered paralleling switchgear that will be installed to provide up to 1188 kWe of power that will drive a nitrogen inert gas system. The Volvo Penta engines provide increased safety for operators by incorporating water cooled exhaust manifolds with radiator cooling to help maintain low surface temperatures and reduce fire hazard in compliance with ABS and SOLAS safety standards. 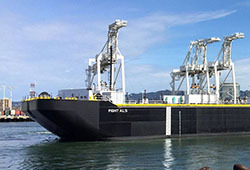 Under construction at Vigor Industrial’s Portland location, the first new barge recently launched with the second barge engines and generator sets currently being prepared at the Pacific Power Group marine division facilities in Kent, Washington.